In today’s competitive real estate market, it’s tough to get top dollar for your home. 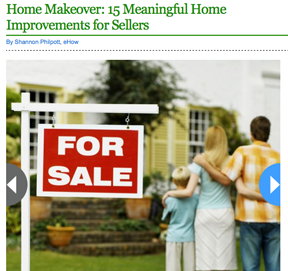 That’s why you’ll want to try these affordable, do-it-yourself home improvement projects, which can add curb appeal and help lead to a “sold” sign in your front yard. “What’s needed is your time and willingness to attend to editing your home and cleaning it up — inside and out,” says Marybeth Dennett, real estate professional with Triangle Star Realty in Durham, North Carolina. Give your home the makeover it deserves with these helpful hints.